Italian car maker Lancia came to life when FIAT racing drivers Vincenzo Lancia and his good friend Claudio Fogolin decided to go their own way in 1906. Vincenzo was an incredibly fast driver and a gifted engineer, which helped him establish his company as a leading light in the early days of the automobile. In quick succession, Vincenzo gave the world several innovations light-years ahead of the competition. Lancia was responsible for the first car with both electric lights and a starter motor (Theta, 1913), the monocoque chassis (Lambda, 1922), a narrow angle V4-engine (Lambda, 1922) and Sliding Pillar“ independent front suspension featuring an early form of the coilover (Lambda, 1922). Sadly, Vincenzo Lancia died of a heart attack on 15 February 1937, preventing him from enjoying the further successes his company would achieve. He was just 55 years old. His widow Adele Miglietti-Lancia and his son Gianni took over the reigns that year. Somehow the two managed to convince renowned engineer Vittorio Jano to join them. Jano was a true technological mastermind. Hi track record consisted of designing numerous successful Grand Prix machines for both Fiat and Alfa Romeo, and helping to define the latter brand’s image during the 1930’s.Under Vittorio Jano’s luminary guidance, the company continued on the same path of innovation. Shortly after the horrors of World War II, Lancia introduced the 5-speed gearbox (Ardea, 1948), the transaxle gearbox (Aurelia & Flaminia, 1950), standard radial tires (Aurelia, 1950) and the very first V6-engine (Aurelia, 1950). Unfortunately, these technological advancements were great feats of engineering, but did little to boost Lancia’s sales. Adding insult to injury, the company still used outdated manufacturing methods, which meant the cars were all still hand-built. This resulted in high manufacturing costs, which combined with Lancia’s lackluster sales spelled disaster. The 1950 Lancia Aurelia remains one of the company's most innovative models. To bolster sales, the brand tried to show off its engineering prowess by entering the world of motorsport for the first time. The Lancia’s had brought Vittorio Jano on board for this very reason, and their confidence in him was rewarded. His D20 sportscar recorded second place at the 1951 Mille Miglia, a class victory at Le Mans and a podium sweep at the 1952 Targa Florio. A more specialized sportscar followed in 1953 with the arrival of the tube-frame D20 and D24. With the D24 Lancia scored another amazing result by locking out the first three positions at the 1953 Carrera Panamericana. With the sportscar program now in full swing, Lancia moved to take the next big step in racing. The Lancia D20 was the company's first dedicated racing car. For the first time in its 52 year history, Lancia would take part in the pinnacle of motorsport. The company would debut in the still relatively new Formula One World Championship, which had seen its inception in 1950. Gianni Lancia, who had taken full control of the company in 1947, ordered Vittorio Jano to design him a world-beating car to take on Ferrari, Maserati and newcomers Mercedes-Benz. The Hungarian-Italian duly delivered by producing the most advanced Grand Prix racer the world had ever seen. His machine incorporated numerous innovative features taken from the groundbreaking Aurelia, including independent suspension on all four corners and a 5-speed manual transmission integrated with the rear axle. The biggest link however, was the engine. Vittorio Jano delivered another masterpiece with the wonderful DS50 engine. Breaking with all convention, Jano had produced a dual overhead cam, four carburetor 2.5L DS50 V8 fashioned from an exotic mix of silicon and aluminium, silumin. The mechanical jewel was intended for a new 2.5L naturally aspirated engine formula which would take effect in 1954. After two seasons under Formula Two rules due to a lack of F1-class entrants, the FIA introduced the new streamlined engine rules to attract more manufacturers to the championship. Despite its relatively small size, the V8 still managed to produce 260 horsepower at 8200 rpm and 210 nm (154 ft lbs) of torque at 6000 rpm. The power figures were impressive, but the engine profited most of all from its incredibly compact layout. As Lancia had already experienced with their V6-sportscars, no one else was using V-engines in motorsport at the time. Instead, Lancia’s rivals relied on large inline four- , six- or eight-cylinder layouts. These units were long, incredibly top heavy and required a heavy subframe to support, which made them objectively awful as racing engines. The V8 was placed at a weird angle to give the D50 a low silhouette. Vittorio Jano’s boxy V8 on the other hand was short, had a lower center of gravity and most importantly could be mounted directly to the chassis as a stressed member. This increased the stiffness of the Lancia’s tubular spaceframe chassis, and negated the need for a large subframe which reduced front end weight. Additionally, Jano mounted the engine at a 12 degree angle to allow the driveshaft to bypass the driver on the left side. In other more conventional cars, the driver sat on top of the driveshaft, which made the car’s center of gravity very high and its handling worse. The crooked engine ensured the D50 could be built as low as possible. The side-mounted pannier tanks represented another major milestone in F1-racing. Vittorio Jano’s obsession with weight distribution and handling eventually produced a design quirk even more outlandish than the sideways engine. Between the wheels, he had mounted large pontoons which filled the gap. Despite looking like crude aerodynamic aids, these peculiar structures served a very different purpose. Traditionally, F1-cars of the time stored their fuel in large tanks fitted behind the rear axle line. As a result the car’s handling was very badly affected. With the mass of fuel sloshing from side to side, and the load on the rear wheels decreasing as the fuel was burnt off during the race, traditional F1-cars were unpredictable tail-happy monsters. Appalling weight distribution caused traditional F1-cars to display dangerously wayward handling. Jano’s solution was containing all that weight between the wheels with the use of two massive pannier tanks mounted to the sides of the car. The end result was an incredibly efficient and compact package. With the engine behind the front axle, the fuel between the wheels and the transaxle gearbox at the rear, the D50 possessed near-perfect weight distribution. A helpful side-effect was a smoother flow of air between the wheels. As a finishing touch the chassis was clad in wafer thin sheets of aluminium. As the car put just 620 kg (1367 lbs) on the scales, massive finned and drilled drum brakes were more than adequate for the D50 stopping needs. When on the move though, the scarlet beauty could reach speeds up to 300 kph (186 mph). The D50's tight packaging was a masterstroke. 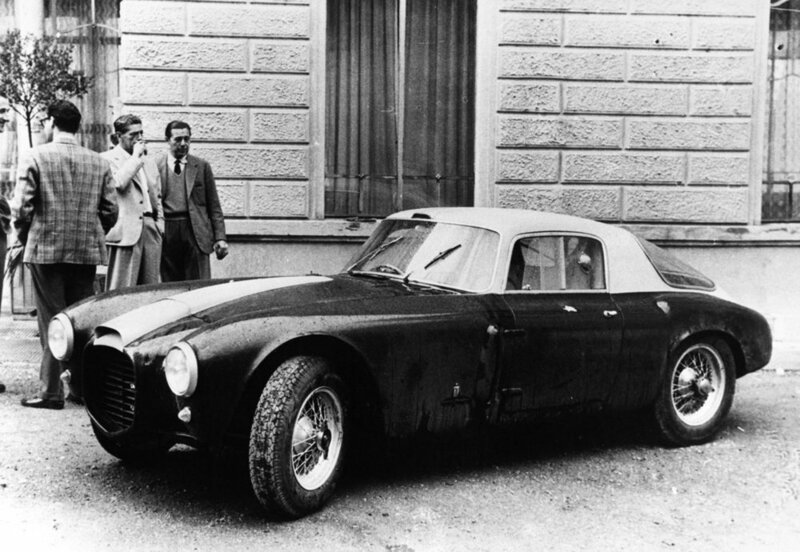 Lancia scored another coup by luring double and reigning world champion Alberto Ascari away from Ferrari to join their works effort. The meticulous Italian star-driver swiftly regretted his decision however, as the space-age D50 took far too long to complete. Without any opportunities for a drive elsewhere, Ascari was forced to wait out its completion until the very last race of the 1954 season. Joining him on the bench was fellow Ferrari-defector Luigi “Gigi” Villoresi, and eight time podium-finisher. Alberto Ascari testing the D50 at Monza, 1954. Both men finally got their first real drive of the Lancia racer at the 1954 Spanish Grand Prix. held on the perilous street circuit of Pedrables. The track was lined with spectators and had little in the way of safety measures to contain them, which resulted in a massive crowd mere meters from the speeding cars. Gigi Villoresi testing the D50 prototype at Ospedaletti street circuit, San Remo 1954. The D50 had a dream debut, as its superior handling and Ascari’s precision immediately propelled it to pole position. In the process he had beaten World Champion-elect Juan Manuel Fangio and the dominant Mercedes W196 R right off the bat. The D50's of Villoresi and Ascari lying in wait, 1954 Spanish Grand Prix, Pedralbes. The Lancia had already been the source of much rumor and speculation, but no one had expected such a sensational debut. Teammate Gigi Villoresi managed a very respectable fifth place on the 21-car grid. Unfortunately, both cars were out in the early stages. Villoresi suffered brake failure in the first lap, and Ascari dropped out of the lead with a broken clutch on lap 9. With this bitter disappointment Lancia started and finished its first season in Formula One on a dreadfully low note. Scuderia Lancia getting the D50's in position, 1955 Argentine Grand Prix, Buenos Aires. For 1955 little alterations were made to the cars save for a power increase to 285 horsepower. The biggest change however was the addition of Lancia sportscar racer Eugenio Castellotti to the Grand Prix squad. Castelotti would make his Formula One debut at the 1955 Argentine Grand Prix held at Autódromo Municipal Ciudad de Buenos Aires. Due to the intense heat and immense physical strain the race put on drivers, most cars were shared between up to three teammates. At Lancia this meant Castellotti was pared with Villoresi, while Ascari drove alone. The former champion once again put the D50 in a competitive position on the grid, recording a time good enough for second behind the Ferrari of José Froilán González (ARG), 1950 Champion Nino Farina (ITA) and Maurice Trintignant (FRA). Juan Manuel Fangio, in another solo drive, completed the top three. The second Lancia of Castellotti and Villoresi was far behind in 12th. Alberto Ascari staying ahead of Juan Manuel Fangio, 1955 Argentine Grand Prix. The grueling nature of the race became apparent on lap 21, when Alberto Ascari made a rare mistake and crashed out of the race. Eugenio Castellotti and Gigi Villoresi’s entry fared little better, as Eugenio also lost control of his D50 on lap 35. Once again the weekend had started out promising, but eh Lancia crew had been hit with a mountain of bad luck. Alberto Ascari entering the famous hairpin, Monaco 1955. Next up on the calendar was one of the most challenging races of all. The crown jewel of Formula One, the Monaco Grand Prix. Provided their cars stayed between the walls and held together, Lancia had a good chance of winning the legendary event. On the narrow city streets of the tiny principality, handling was everything. The track was littered with tight slow speed corners, which made Vittorio Jano’s incredibly balanced design a godsend. Where other machines would understeer wide of flail their back ends out, the D50 would remain totally flat. This allowed for far greater corner speeds, and put less strain on the driver. With the car’s superior design coupled to Alberto Ascari’s pinpoint driving style, Lancia had high hopes for a good result. Scuderia Lancia's four car attack force, 1955 Monaco Grand Prix. To ensure a better chance of survival, Scuderia Lancia fielded a four-car team at Monaco. The first three machines were occupied by regulars Ascari, Villoresi and Castellotti, while the fourth was taken by 55-year old veteran and local man Louis Chiron (MON). A second pole position was not to be however, as Mercedes’ Juan Manuel Fangio narrowly snatched it from Ascari, who started 2nd. Stirling Moss took 3rd for Mercedes, with Castellotti 4th. Gigi Villoresi found his way to 7th, with the elderly Chiron only able to muster a 19th time out of 20 starters. The field squirming through Gazométre hairpin. 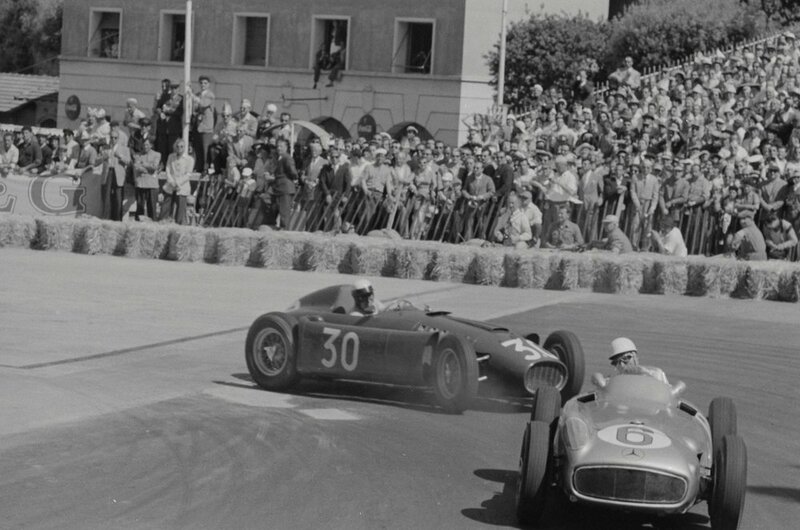 Ascari (26) third behind the two Mercedes, Monaco 1955. The two Silver Arrows rocketed away at the start, leaving the Lancia’s to give chase. The order was Fangio, Moss, Ascari and Castellotti, and remained unchanged until halfway through the race. Mercedes was building a sizable lead over the Italian machines, and showed no sign of letting up. The German machines were disappearing into the horizon, leaving Lancia to pick up the crumbs once again. 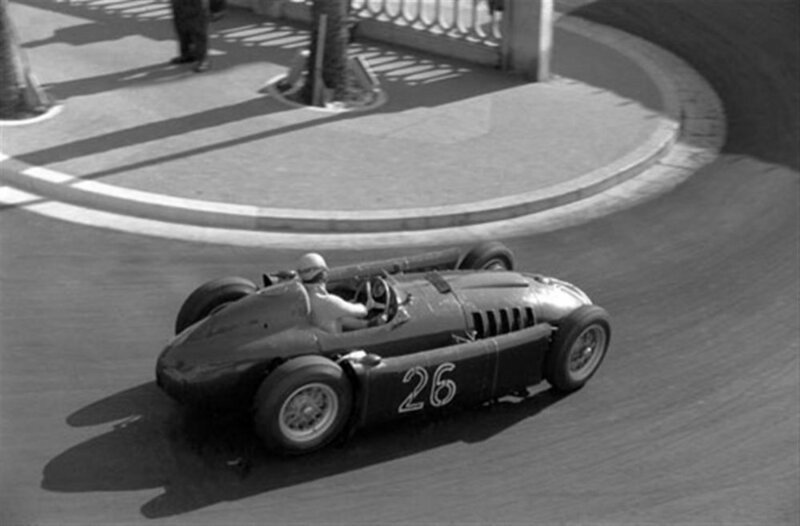 Eugenio Castellotti drove a fabulous race at Monaco. 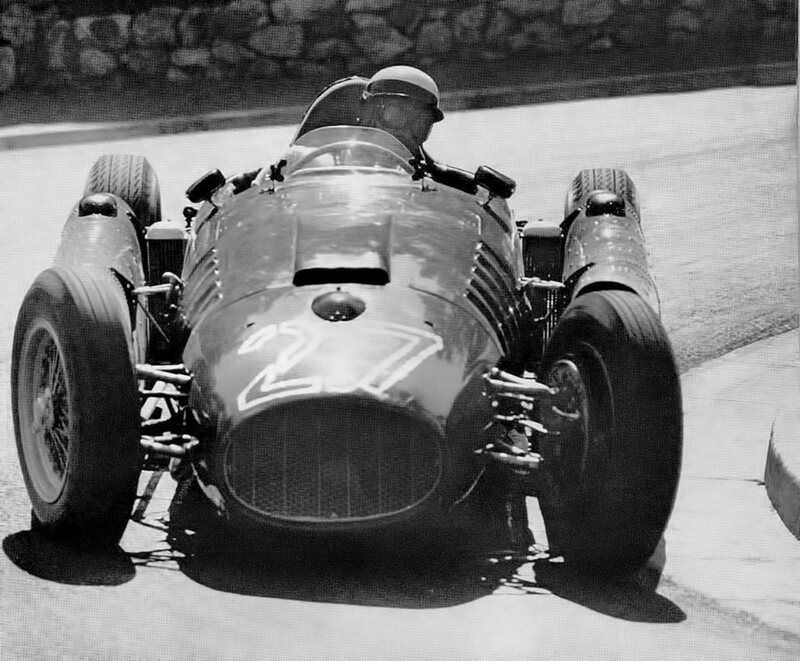 Suddenly Fangio slowed with a transmission failure, handing the lead to teammate Moss. The Englishman had no cause for concern, as Ascari was already almost a lap behind. The Italian kept pounding round in hope of a miracle however, and that was exactly what he got. On lap 80, his prayers were answered. Out of the blue, Stirling’s engine blew and the second Mercedes was out of the race. Alberto Ascari had little time to enjoy his new lead however, as he made a terrible mistake on the very same lap. Coming out of the tunnel and into the Chicane du Port, Ascari got it all wrong under braking. His car careened off to the left and slammed right through the guardrail. On most tracks, this would have been a serious problem, but at Monaco it was disaster. Ascari found himself hurtling into the harbor with only seconds to separate himself from his car. Through a stroke of incredible luck, he emerged unharmed and swam to safety. Alberto Ascari going for a very scary swim, Monaco 1955. Meanwhile the race went on, and Maurice Trintignant took the lead from Ascari in his Ferrari 625. Tailed by Eugenio Castellotti, the Frenchman drove to his maiden Grand Prix victory. Gigi Villoresi came home an impressive 5th, followed by Louis Chiron in a scarcely believable 6th position. By far the oldest driver to ever start a Grand Prix, the Monegasque has simply paced himself and stayed out of trouble, whihc saw him gain a spectacular 13 places. 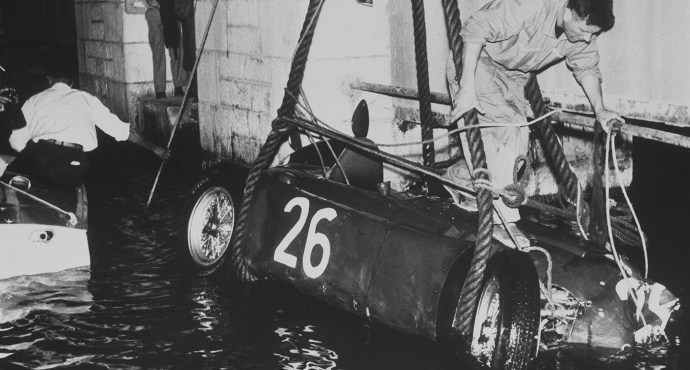 Alberto Ascari's Lancia being lifted from the harbor, Monaco 1955. In a sad twist of fate, Alberto Ascari died in a testing accident four days after his miraculous escape from Monaco’s clear blue waters. 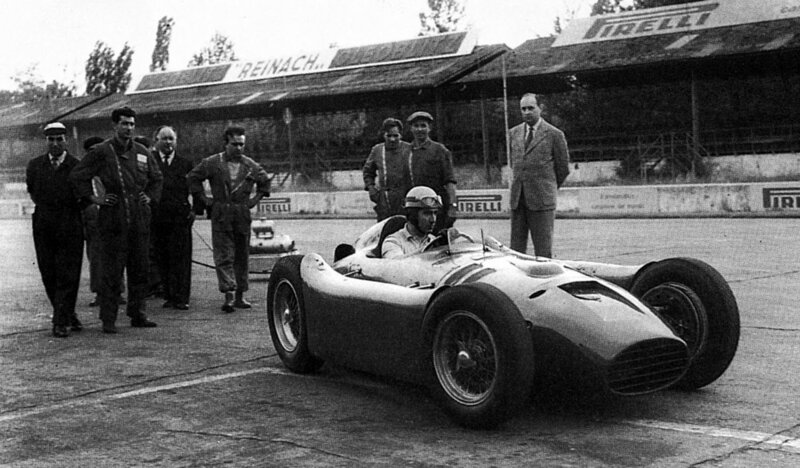 Ascari had gone to Monza to watch his friend Castellotti test the new Ferrari 750 Monza sportscar, which the pair would use in that year’s 1000km race. They were granted special dispensation from Lancia to do so, as the company was in no position to refuse their star driver an opportunity to drive somewhere else. 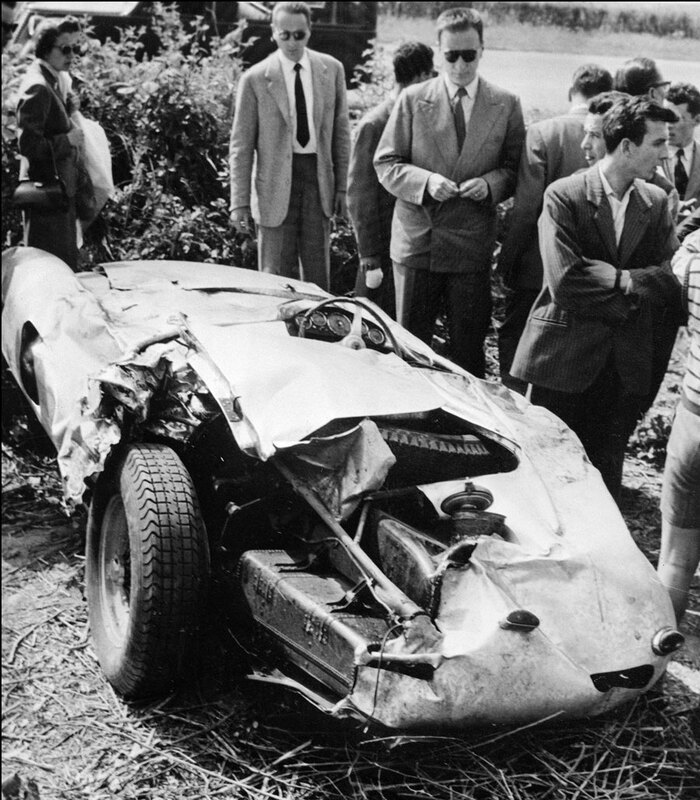 The wrecked Ferrari 750 Monza after Alberto Ascari's fatal crash. Attending in a flawless business suit, Ascari didn’t intend to drive himself. But after seeing his friend enjoy himself for a few laps, he couldn’t resist. 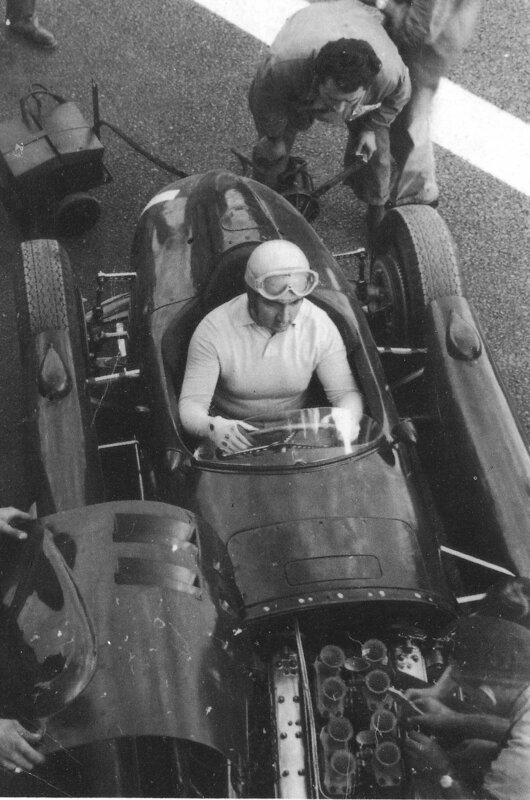 Still wearing formal attire, complemented by Castellotti’s helmet, he climbed into the Ferrari and set off. While negotiating the lightning-fast Curva del Vialone, the Ferrari suddenly and inexplicable skid off the track, and somersaulted twice. Ascari was thrown out of the car and into the track, where he suffered injuries that would take his life mere minutes later. He was just 36 years old. The eerie accident was never fully explained, and caused an unnerving coincidence to occur. Ascari died at the same age, on the same day of the month and in same profession as his father Antonio, a famous racing driver who lost his life at the 1925 French Grand Prix. In the wake of Ascari’s untimely death, the high-speed Curva del Vialone was turned into a chicane, which was christened Variante Ascari. Ascari’s death shocked the world, but no one was hit harder than Lancia. The firm had now lost its star driver, and faced an ever-growing mountain of debt. The costly Formula One adventure wasn’t yielding the results the company had hoped for, and road car sales were at a steady decline. Left with no other option, Gianni Lancia sold his company to Italian industrialist Carlo Pesenti in 1955. Lancia also sold most off its F1-team to an eager Enzo Ferrari, who was in desperate need of a more competitive machine. Eugenio Castellotti harassing Stirling Moss, Spa Francorchamps 1955. A single car stayed with Eugenio Castellotti, who privately entered it into the 1955 Belgian Grand Prix at the gigantic 14.1 kilometer Spa Franchorchamps circuit. Castelotti caused a sensation by taking pole position at just 24 years of age, a record he would hold for 13 years. Sadly he retired on lap 16 with incurable gearbox issues. Enzo Ferrari had meanwhile taken the liberty of rebranding his new purchases with his own name. Twi Ferrari D50’s were entered into the 1955 Italian Grand Prix for Nino Farina and Gigi Villoresi, but neither were able to start due to tire problems. This would prove to be the last showing for the original Lancia cars, as Ferrari promptly hollowed out the innovative pannier tanks to make way for side exhausts for 1956. The Lancia D50 was the world’s most innovative car maker’s idea of the perfect Grand Prix racer. Designed by one of the sports most prolific engineers, the D50 incorporated technology that was decades ahead of its time. With independent suspension, a four cam V-layout engine as a stressed member and fuel tanks between the wheels it was an incredibly packaged, well-balanced machine. By chance Vittorio Jano had also invented the aerodynamic sidepod, but financial woes and the death of Lancia’s star driver caused these innovations to fade into obscurity. As Enzo Ferrari turned the hacksaw onto the beautifully engineered Lancia’s, unknowingly sacrificed an immeasurable amount of knowledge. Nevertheless, the butchered Ferrari D50 propelled him to the 1956 World Championship title with Juan Manuel Fangio.